Green Fire. As my co-host Rho will tell you, it is the ‘Lucy’s football’ to the Charlie Brown warlock class in the game. Warlocks have been wanting green fire for their spells since… well I think since they saw the fel fire of Outlands in Burning Crusade. Truly, the fel fire is something that should have been in the game for a long time, but I am not sure if Blizzard had decided that demonic fire was green until they began developing Burning Crusade, and by then the warlock class and their normal red fire was already in game. Just my guess. I have seen a few comments here or there, though, that have confused me a little bit. First, the ability to get green fire as a warlock will be a hard thing, requiring a drop in game that then takes you through a chain that even highly skilled and well geared warlocks on the PTR have said is very hard to do. Once you complete the chain, which takes you into the Black Temple, Mr. or Ms. Warlock Hotstuff will be casting any fel fire spells as green. It’s a lot of work for a simple change of color, but I am sure more than a few warlocks out there will be very happy to have the change. Now here is the rub. One of the more recent questions I have seen was from someone who was wondering if there will be any way to turn off the green fire. Turn it OFF?!? You fought for years to get something, but now before it is even fully available, you want to be able to stop it? At first glance it makes absolutely no sense to fight long and hard to get something, only to beg for a way to make it go away, but Rho has helped me understand a bit better. When I asked Rho about this, his answer and thinking did make some sense, though I do have a few issues. According to Rho, the point that he might want to disable green fire would be if green fire became ‘ultra-common’, which is to say if practically every warlock in the game had the green fire ability. This concern is offset by the apparent difficulty of doing the quest, added to the rarity of finding the item to start the chain in the world. Between these two it does sound unlikely that green fire will become ultra-common any time soon. My biggest issue with this is that Blizzard singled out the Warlock class for this change. I cannot change the color of any of my spells, and every Ret Paladin has the exact same spells, the exact same color and animations as I do. Druids cannot change their moonfire pink, nor can Priests change their shadowfiend into a rainbow monstrosity of cheerfulness. I personally don’t think Blizzard should have made green fire a quest or an option; it should have been that all warlocks would be moved over to green fire spells as of a certain patch. This means, to me, that your spell color becoming too common is a bit confusing, because every other class and spec combo in the game has the same. Makes it odd that only warlocks get this ability to change how it looks. At worst the ability should be based on glyph, but it should not be as big of a deal as it seems to be now. Do you think that warlocks are being too picky in wanting the ability to change the color at all, or to disable this color they have been fighting so hard to get? Do you think other classes should get cool class quests for unique stuff? Let us know in the comments. Thank you to @Amijadethelock of Warlockery for the screenshot! This entry was posted in Editorial/Opinion and tagged Class, Fel, Fire, Green, Quest, Spells, Warlock. Bookmark the permalink. I wish I could find the source, but I’m pretty sure Dave Kosak has mentioned that there is no reason other classes won’t get similar treatment in the future, they just don’t want it to feel forced. I have purposely stayed away from green fire spoilers for when I revive the lock and embark on the chain. I do find it curious they didn’t simply make it a glyph ala the shaman’s Glyph of Deluge (makes Chain Heal appear watery instead of greenish-yellow), especially now that Blizzard has indicated locks will be able to toggle between green/orange fire after completing the chain. That said, it would be cool if they added these things for all classes. First, I just want to say thanks for including one of my screenshots in the post. I’m glad you found one you liked and could use. In regards to green fire toggling, I think this is a nice step towards more player customization. Will warlocks be the only class in the future who will have this kind of option? I doubt it. I can see them implementing these kinds of changes for all of the classes eventually. I’ve heard suggestions about inscriptionists being able to make gear dyes for more transmog creativity, and I’ve heard suggestions about blacksmiths being able to add cosmetic changes such as chains, spikes or whatever for even more armor customization. Heck, someone even suggested that the barbershops offer the option for customizable character tattoos. I think anything that allows the WoW player base to personalize their characters is a good thing and it should be supported and embraced. Look what Transmogging has done for revitalizing so many different aspects of the game. From the AH markets, to running old content, to addons, websites, blogs and podcast discussions, transmog customization opened up so much for the players, the community and the game. 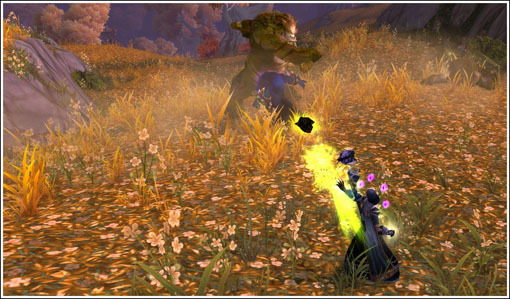 We can only hope that the warlock green fire toggle ability is a trial balloon on Blizzard’s side to see where this could eventually lead for all of the classes. I’m curious if anyone had concerns like this when hunters were given challenge tames in both Cataclysm and in MoP? I haven’t heard of any. I know some people hated the old class line quests and some people loved them. I think we can all at least come to the agreement that more content and more choice is never a bad thing.